An innocent dragon is under attack! Vikings are harassing the peaceful creature, and it’s your job to protect its home. Watch as the Vikings, drunk off of a tasty elixir which grants them incredible strength, try to move the dragon’s nest from its resting place. 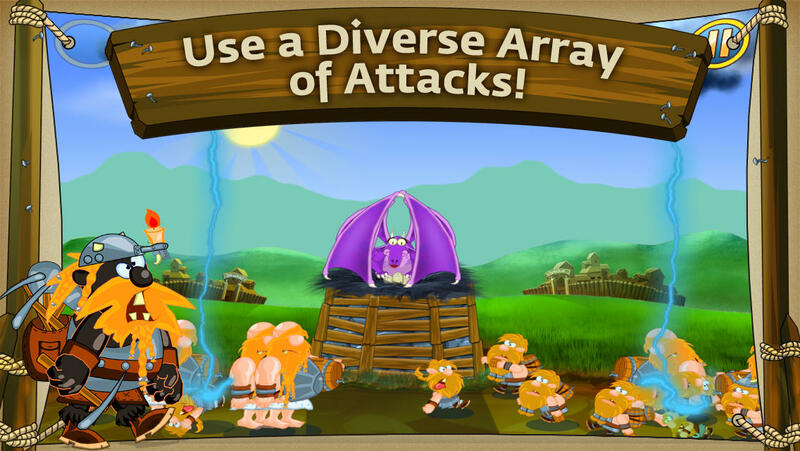 Are you brave enough to fight off hordes of the Viking menace and save the dragon’s home? Find out today in Drunk Vikings! Flick and fling the intrusive Vikings away from the dragon’s home, slinging them across the screen and watching the whacky animations unfold in a true visual masterpiece. The act of throwing the Vikings around causes the effects of the potion to wear off, thus ending their terror on the dragon’s nest. You have to be quick, because these foul Vikings attack from every possible direction, be it land or air! Rescue the dragon, and save the day! ◇ 30 visually stunning levels! ◇ Hilarious Vikings of every sort and kind! ◇ Powerful upgradable bonuses to aid you in battle!